We enjoyed a sunny day at our local airport for the celebration of 100 years of flight in Canada. 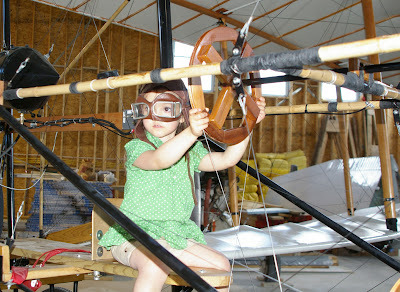 A real highlight for the whole family was the viewing of the replica of the original Silver Dart which flew on February 23, 1909 over the Bras D'ors Lakes in Nova Scotia. A glorified bicycle with wings, this piece of history is truly amazing and the work and passion of the re-creators made it a real delight to see and feel (and yes, sit in, for some!). The plane will be touring various air shows throughout Canada this year, and is definitely worth the visit!